Are you still trying to get rid of unwanted Labor Day stains? 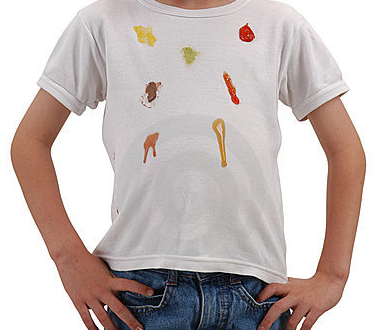 Or, are the kids bringing big stains home from school? Here are some tips on how to get rid of the most common stains. Treat the stain immediately or as quickly as you can. Don’t rub it in more, blot instead. Make sure you remove the stain inward so you don’t make it bigger. Don’t let it dry if you can help it. Mustard – Use Hand Sanitizer. Blot the stain. Ketchup – Use lemon juice and the lemon rhine to blot. Corn on the Cob (oily stain)- Get the oil out with baby powder and shaving cream. Let it sit and it lifts the oil out. Iced Tea – Make a paste by using baking soda and hydrogen peroxide. Let it set for 30 minutes and blot. Wine – Mix toothpaste and hydrogen peroxide. Brush the stain with an old toothbrush. Sofa Cushions – Fels Naptha Soap (stock up! $1 for a limited time). Blot with a wet cloth. Rub the bar of soap over the stain. Lifts the stain. Do you have any suggestions for those hard to get out stains? Share them below! I am the worst about dropping food on me when I eat and I have trouble getting stains out. I have never heard of some of these solutions, specifically the ketchup and mustard stain removers, and will definitely give them a try. Thank you for sharing these great tips! Great tips on stain removal. Using shaving cream is a good one. Never knew that. This is great info as I spill food on myself all the time! And, I’m the mom to 3 messy boys! haha I’ve always seen Fels Naptha for sale for $0.97 at WalMart. Maybe it’s more in other places? thanks for the tip stain info. Great article. Awesome. Thanks for posting. Printing this and putting on my fridge. Oh my Gosh!! This is sooo helpful thank you soooooooooooooooooo much for this! I am now printing this out now!!!!!! I totally forgot about Fels Naptha soap!!! Thank you for the tips, I recall that the soap worked very well, so these other ideas are going to be my next try, I won’t fret the holiday accidents so much!! thank you so much . i use a cap or two of ammonia to remove the smells but i never knew how to remove ketchup and etc. Between my husband and my daughter, I have to treat a lot of stains. Thank you for the tips. I have the hardest time trying to get rid of stains especially ones that have been there for a while. Thank you for the tips. Baby powder and shaving cream-Who knew? I will definitely try this. I sure could use the lemon on ketchup one as well. I never get ketchup stains out! These are awesome cleaning hints I can’t believe I’ve never of any of them. I can’t wait to try them out. Thank you very much for the tip on how to get ice tea stains off. With the Spring/Summer warmer weather I serve ice tea all the time and inevitably the kids will spill some on their clothes and/or the tablecloth. I have made a note of what to use. ! These are great tips, thanks for sharing them. Fels Naptha is wonderful and always a stand by for me. These are very helpful tips, I’m often getting food stains on my clothes, thanks for sharing!